Here is how to stream podcasts episodes online and save them to listen offline. You’ll also know how to delete episodes if you want to get rid of them. Streaming podcast episode online is more straightforward, but it will consume a lot of data. So if you’re streaming episodes with your mobile data, then it will take eat up a lot of your data. So, it’s good to stream with an unlimited data plan or a Wi-Fi connection. 1. Open the ‘Podcasts’ app on your device. 2. Go to ‘Library’ to see your episodes list. 3. Use ‘Browse’ to find new podcasts. 4. Or use ‘Search’ to find a specific podcasts episode. 5. Find the episode into the episodes list. When you’ll find an episode, tap on it to play. 6. Tap on ‘Details’ of the episode to see show details. Tapping on an episode will start streaming it immediately, it will depend on your internet connect how much time it will take to start. It’s a good idea to download a podcast episode to listen to it later either you have an internet connection or not, especially when you have limited data plan. 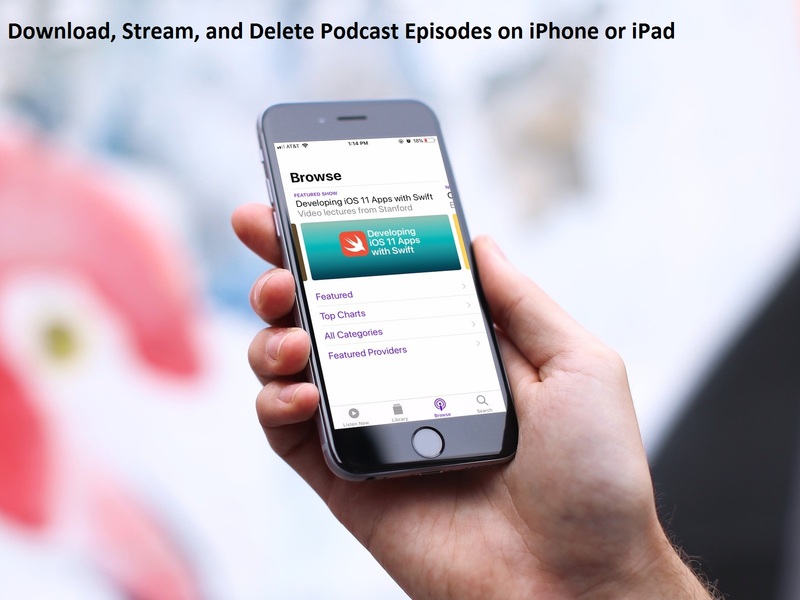 You can also use a Wi-Fi connection to download podcast episodes on your iPhone or iPad. The downloaded episodes can be played anytime, anywhere, with or without a connection. 2. Go to the ‘Library’ to see your shows. 5. If you like a video and want to add it in your library, then tap the ‘+’ button of the podcast's episode to add it to your library. 6. After adding an episode to your library, you can download it on your device. The download button is the icon looks like a cloud with an arrow facing downward. After downloading an episode, it will store in your device hard drive. Now you can listen to it anytime when you want. If you want to remove a podcast episode after listening to it, then you can easily delete, and this will also free up some space. 2. Go to ‘Library’ to see your shows from the bottom tab menu. 3. Go to the ‘Show’ to select an episode to delete. 4. Select an episode you want to remove. 5. Tap on the episode and swipe to the right. This will reveal the delete option. Or swipe further to delete without delete option. 6. Tap ‘Delete’ to remove.